Dogs have been used in Public service for a long time. They are not only used for security but also for patrolling and crime detection. By tracking and searching concealed persons and hidden objects. They have also been used to search for hidden drugs. Many breeds such as GSDs, Labradors, Rottweilers, Schnauzers, Bloodhounds, Dobermanns , Beagles and Cocker Spaniels are being used. Search and rescue dogs have been trained to find people hidden under the snow, under debris of buildings and during disasters. their scenting ability and desire to perform is excelled by no other animal. Guide Dogs are dogs that help the blind to "see" through a maze of traffic. 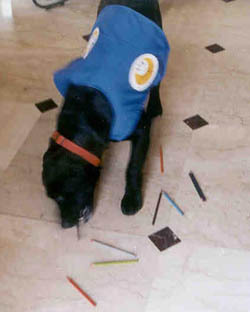 Training dogs for such services is a long drawn out expensive and exhaustive effort. Only a few dogs out of the many taken up initially will prove to be suitable enough to be trained for such speciality work. If not for the generous contributions from well-wishers, suitable dogs cannot be placed with the blind who need them. All through history dogs have served man, in peace and war, guarding his home and livestock from intruders, carrying and pulling heavy loads and being a loyal companion. In times of war, dogs have served as messengers, sentries, scouts and lifesavers. In the modern-day fight against crime, dogs assist in sniffing out drugs and explosives and tracking down wanted criminals. 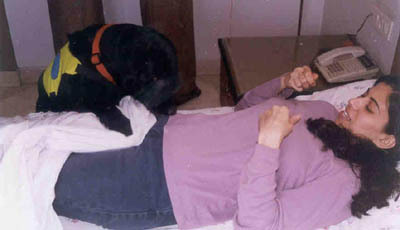 In recent times dogs have been busy giving a new lease of life to people who are physically challenged. India has a huge and ever-growing population of physically disabled people and not enough facilities to help them. Though a lot of Government and Non-Government Agencies are doing their best to alleviate some of their problems, there are so many other unexplored options. For the past few years the Mumbai based unit "CANINES CAN CARE" has worked to train dogs to aid individuals who are physically challenged. 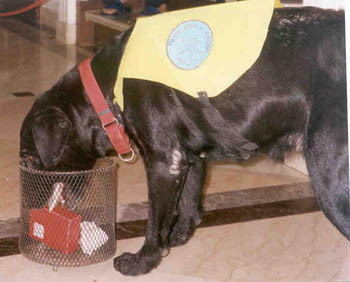 The dogs help the handicapped to achieve their desire to be independent by performing tasks that are physically demanding. It is very difficult for an able-bodied person to imagine the plight of a physically handicapped person. Trivial daily tasks which we take for granted like picking up a fallen object or opening a door, present a daunting challenge to the handicapped. With most disabilities the person suffers from a limited use of their hands, feet and fingers. In many cases the person is unable to close their fist or to grasp an object or to pull and push, making the simplest of tasks frustrating and incapable. This is where an Assistance Dog can aid the person in being independent. 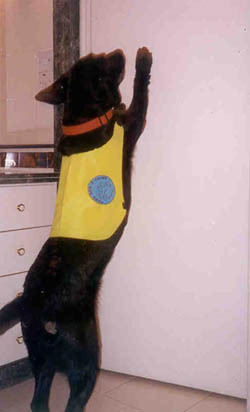 A fully trained Assistance Dog can understand up to fifty commands. A few of the tasks they can carry out are listed below. A Canine Companion also dramatically enhances the life of an adult or child with a disability by helping him/her overcome physical and social barriers. The Canine Companion becomes a loyal friend, providing constant companionship and unconditional love. 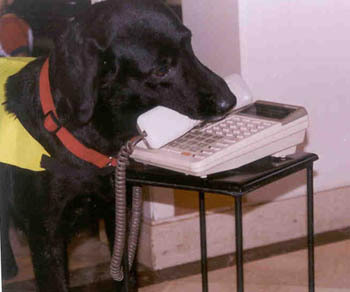 Indias first fully trained Assistance Dog is a black Labrador called Honey. Honey is capable of understanding up to fifty Assistance Dog commands, and regularly gives demonstrations all over the country. Concurrently, the organisation has one puppy in training who is living with her physically challenged companion and one puppy who is growing up in a Puppy Raiser home. Both are Mumbai based. We at "Canines Can Care" are constantly striving to help disabled people gain independence with the help of assistance dogs. It is the dedication of "Canines Can Care" volunteers, puppy raisers, members and the generosity of donors that make this remarkable program possible in India. There are many ways in which a person can help sustain and promote the work "Canines Can Care" has set out to accomplish. If you believe in independence and freedom for all living creatures please show your support. My name is Cathleen. I am 13 years old. My best friends little sister is autistic, and has a companion dog names Beaumont. He is a black lab, and has been living with them for about 2 years, now. He came from a service dog organization in Massachusetts. Well, I loved Beaumont, and had never really had a dog of my own- only when i was little- so I looked into getting a service puppy. I would train im to be a service dog by socailizing him, and house breaking him, then he would go back to the training center. I told my parents about it, and they didn't want one. I finally persuaded them into it and in July of 2001, we got Marley, an Australian shepherd who was the most adorable dog anyone in the world could have ever imagined. He was simply perfect, happy, fuzzy, and all around adorable. He was mostly black, with brown and white legs, and a white stripe on his head. Everyone I knew thought he was sooooo adorable. He was a pain to take out, as all dogs are, but it was worth it. Marley was very hyper, and was out of control sometimes, being so hyper, so the people at the training center asked us to bring him down for an evaluation. We did and he was brought into the center for being a hearing dog. It was heartbreaking that day. We didn't think that he would go so soon, it had only been 5 months. He is now in training and will graduate in the end of April. I am so proud of him and at the same time, incredibly sad. my family is planning on getting another puppy in the summer. If anyone is thinking of becoming a puppy raider, you definitly should. it is fun, and you are so proud of the dog after you give them back. Also, you are allowed to bring them into public places, with the store's approval. Marley was so cute in his little blue cape, saying that he was a puppy in training.